We are slowly learning more and more about the sinister motives, moves and machinations of Sultan Erdogan as this Syrian drama unfolds. It will bring down not only the House of Saud, but also the fake Sultanate of ISIS lead by Sultan Erdogan who is a lynch pin in the Zionist Cabal ruling over the world. How deep down the rabbit hole do we need to descend to find out who and what exactly is this beast called Sultan Erdogan? Answer = pretty far deep. Not only is this beast blackmailing Europe with a manufactured crisis called the Migrant Invasion of Europe in line with Mazzini and Pike plan for Europe set way back in the late 1800s. 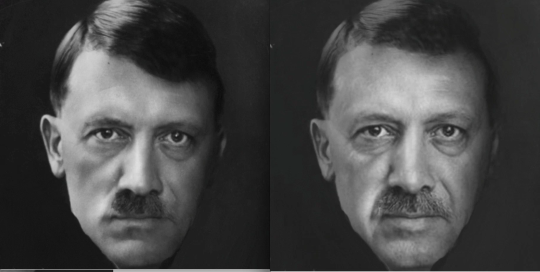 Consider the similarity between heir fuhrer and the new fuhrer. Try to spot the difference if you can if you truly have eyes that can see. These magicians are master builders and their works of truly magical and beyond understanding at times. Such things sometimes can only be felt and understood at a deeper level of the heart and the inner mind. Who is this man from the past? Some answers can be found when you first try to understand who is this man from the future that they are now trying to alert us about? Everything is connected and it is just up to viewers and listeners and readers to connect the dots and understand the plan. The plan is dark and not born in love or mercy. It is born in deception and deceit and bad choices here will have consequences for all of us later on that day when it will truly matter. Prepare yourselves for the fall and rise of Syria because Syria is the absolute end game. When Syria, Yemen, Saudi Arabia, Russia, Israel, and Constantinople are all in play the signs should be explicitly obvious.